Release 3.2.2 of the OneLogin Browser Extension for Safari brings new, more robust functionality to let you add an app to your app catalog when you log into the app. An Add App dialog appears instead of the Add App button of old. The new Add App dialog lets you decide whether to add the app for personal use or make it available as a company app. It also detects a larger number of apps than the old Add App feature could detect. 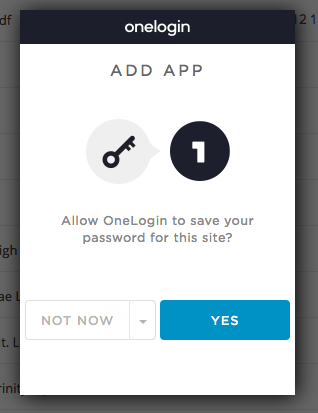 It even detects apps that aren't included in the OneLogin app catalog and creates app connectors on the fly. It's a great way to add apps to your catalog with minimal effort. For administrators, we have added functionality that lets you use policies to enable the Add App feature for your users. Indeed, if you want users to have access to the new Add App feature in Safari, you must enable the feature for a policy and add users to the policy. Enabled users can control the visibility of the feature for themselves on their user profile preferences. For details, see Adding Apps using the Browser Extension. Note. There is a delay between the release of an extension and its availability in the Safari Extensions Gallery. It may take over a month for this version of the extension to be available in the gallery. If you want the extension right away, you can download the extension file from your Profile page instead for a limited time. You may need to uninstall your existing OneLogin extension before you install from the download. That said, we do not recommend that you install the extension from the download, because extensions installed in that way are not updated automatically when new versions are made available. If you originally installed the browser extension from the Safari Extensions Gallery, it will update automatically over the course of the next 4-6 weeks. Go to Safari > Safari Extensions. In the Safari Extensions Gallery, search for OneLogin. In the search results, click Install now under OneLogin extension. For more information about installing the Safari extension, see OneLogin Browser Extensions.